The Ecotron interface, showing the available Eco Furni. The Ecotron was a means of transforming unwanted Furni into furniture from the Eco line; exclusive pieces of furniture which could only be attained through recycling. The Ecotron menu was accessible from the Shop within the Hotel, paired with instructions and an up to date list of attainable Eco Furni. This tool was removed from the catalogue on August 24, 2012. It replaced by the more modernised Furni-Matic with different furni rewards. 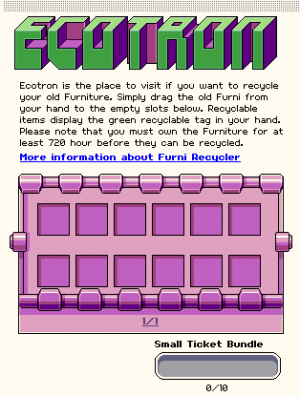 To recycle using the Ecotron, five eligible Furni (Furni that carries a green recycling symbol) would need to be dragged from your inventory into each of the five recycling slots. After all five slots are filled, the Recycle button could be clicked clicked - which deposited an Ecotron prize box into your inventory. This could be placed in a room and opened, or traded in its unopened form. 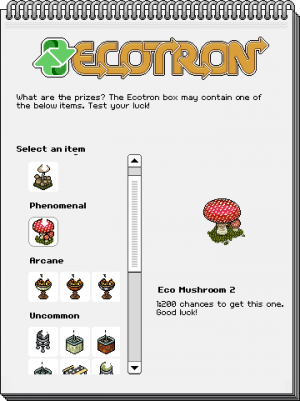 The ecotron rewards included a skull, red and a leaf design and the top 2 rarest rewards were mushrooms. When the new Ecotron came out, an Orange Tree and a Pear Tree were the rare rewards instead. Obtainable Eco Furni was split into five categories, Uncommon, Common, Arcane, Phenomenal and Urban Legend - from most common to rarest. Common "If all else fails" (If you don't land on any of the rarities below in the Random Number Generator Potted Cactus 1, Potted Cactus 2, Potted Cactus 3, Eco Lamp 1, Eco Lamp 2, Eco Lamp 3. Uncommon 1:4 Eco Stool 1, Eco Stool 2, Eco Stool 3, Eco Armchair 1, Eco Armchair 2, Eco Armchair 3, Eco Coffee Table 1, Eco Coffee Table 2, Eco Coffee Table 3, Eco Light 1, Eco Light 2, Eco Light 3, Eco Curtain 1, Eco Curtain 2, Eco Curtain 3. Urban Legend 1:2000 Eco Mushroom 1, Orange Tree, Pear Tree. Tickets First time you recycled. Used for BattleBall, Snowstorm, and Wobble Squabble (until the ticket system was removed). Eco Friendly Penguin First time you recycled. (Available after Tickets were removed) Given to Eco friendly Habbo! On the 4th of May, 2012, it was announced that the Plasto furni range would be leaving the Habbo catalogue for good on the 12th of May that year. During this time, the Ecotron would only recycle Plasto furni and, instead of needing 5 items in order to recycle, only 3 Plasto furni were required. All the rewards had been changed during this promotion too and included furni from a new line of Black Plasto furni. Common "If all else fails" (If you don't land on any of the rarities below in the Random Number Generator 1/5 chance including the following: Black Occasional Table, Black Four-Leg Table, Black Round Dining Table, Black Plasto Chair, Black Square Dining Table. Arcane 1:10 Black Plasto Chair and Black Round Dining Table or Black Square Dining Table, Black Occasional Table, and Black Four-Leg Table. Phenomenal 1:100 Package of all 6 Black Plasto Furni. This is the only way to generate the Black Pod Chair. This page was last edited on 7 November 2016, at 16:54.